At a meeting of a City Council subcommittee, dozens debate the pros and cons of a measure that would affect workers and businesses in Portland. Dozens of people on both sides of Portland’s proposed paid sick leave ordinance testified Tuesday night before the City Council’s Health and Human Services Committee, the crowd filling both the downstairs and upstairs seating areas of the council chambers. The public hearing went on for more than three hours, but a final recommendation to the full council won’t be made anytime soon. Councilor Belinda Ray, who chairs the three-member committee, said she anticipates having an ordinance and fiscal note ready for council consideration before the end of the first quarter of 2019. A fiscal note would detail how much it would cost the city to implement and enforce the new law. Ray said her committee will meet again on Feb. 12 to consider more changes to the proposed ordinance before sending it to the council for consideration. Councilors Pious Ali and Brian Batson also serve on the committee. Mayor Ethan Strimling, who attended the meeting, said the committee is now recommending that the ordinance be revised so that all workers in Portland – including full-timers, part-timers, seasonal and temporary workers – would earn one sick hour for every 30 hours worked for up to 40 hours or five days a year. If the measure passes, Portland would become the first municipality in Maine to mandate paid sick leave. The issue is attracting a lot of attention from different sectors of the city. Those include individuals forced to choose between infecting their co-workers with the flu or staying home and not being paid, and large enterprises like Northern Light Mercy Hospital, which already offers a paid time off benefit that is more generous than the proposed paid sick leave measure, hospital President Charlie Therrien told the committee. 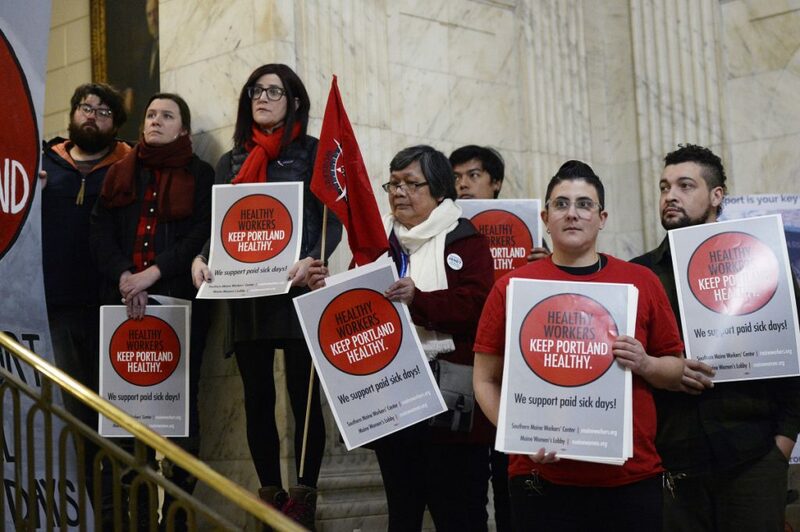 Before Tuesday night’s hearing, members of the Keep Portland Health Coalition staged a media event in City Hall to draw attention to their cause. “People who don’t have paid sick leave are being forced to go work when they are sick. This issue is a public health issue and a social justice issue,” Eliza Townsend, executive director of the Maine Women’s Lobby and the Maine Women’s Policy Center, told the gathering. Organizers of the news conference said the proposed paid sick leave ordinance would benefit about 19,000 people, most of whom work in the restaurant and hospitality industries. Emily Russo, the owner of Print: A Bookstore in Portland’s East Bayside neighborhood, spoke at the committee hearing. She employs three people and supports the ordinance. Therrien said Northern Light Mercy Hospital “supports the spirit of this ordinance” but remains concerned because it could “disrupt” his business’s ability to recruit and retain workers. The hospital, which already offers a paid time off package that can be used in a number of ways, would be required to carve out six days of paid sick leave from its PTO if the ordinance is adopted. Therrien asked the city to exempt from the ordinance employers who offer a more generous paid time off package.